A very peculiar pet shop in a very peculiar neighborhood. Create and splice over 62,000 combinations of abominations and sell them to children. Theoretically infinite gameplay! Uses mouse, wasd, and f/enter for controls. Click on the sliders to adjust DNA levels on the recombinator. Has not been tested on Mac or Linux -- if you get issues, download the .pck file as well. 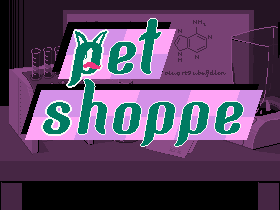 I enjoyed petshoppe immensely. More people should play this!